Product #32074 | SKU 96910 | 0.0 (no ratings yet) Thanks for your rating! Need to record HDTV programs or back-up your photo or music collection? 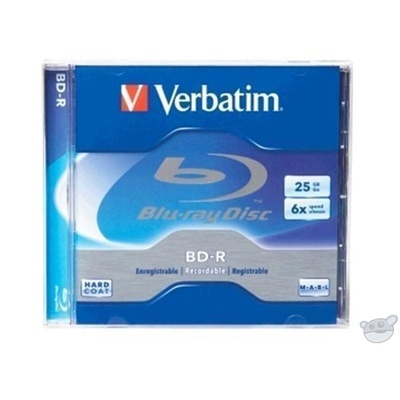 Verbatim offers Blu-ray single-layer media that can store up to 25GB of HD content or data files. Using blue-violet laser technology, these Blu-ray discs can handle up to 1080p resolution and multiple audio formats - perfect for HD video and surround sound. And, all Verbatim Blu-ray discs are treated with a super hard coat to prevent scratches, resist fingerprints and reduce dust build-up. Compatible with the latest Blu-ray hardware like Sony, Pioneer, Panasonic and LG, Verbatim Blu-ray media offers you an amazing high definition experience right in your own home.